#101 Link to this post, but load the entire thread. April 5th, 2017 (10:15 AM). I am going to cancel my Ultimate Mono-water challenge and just leave it at these 3 games. The reason for this is because I just can't find the motivation to keep going. #102 Link to this post, but load the entire thread. April 6th, 2017 (8:22 PM). Edited April 6th, 2017 by Lynda. I was waiting for Sun/Moon to come out so I could get back into this. Still working on obtaining functional copies of all the games, and I now have fixed copies of Red/Silver/Sapphire, and also X. Still need to get White, Pearl, and Sun. Anyhoo, I figured I'd join back in on the fun! #103 Link to this post, but load the entire thread. April 8th, 2017 (11:26 PM). #104 Link to this post, but load the entire thread. April 10th, 2017 (4:30 PM). #105 Link to this post, but load the entire thread. April 10th, 2017 (10:09 PM). ☕ milk tea & 💻 code. #106 Link to this post, but load the entire thread. April 11th, 2017 (7:19 AM). Edited April 11th, 2017 by Swagroar. 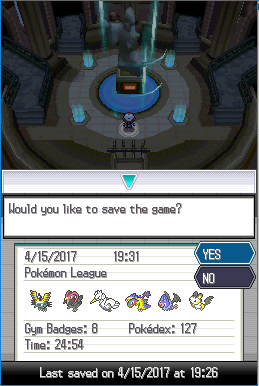 After beating Norman, I went through Route 118 and was met with Steven, who wanted us to go to Southern Island upon Latios' plea. 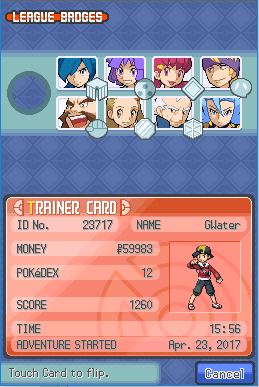 Once we were there, we took on Matt and a Team Aqua grunt, and they weren't too bad, though Steven wasn't very much help. Latias joined me, and I went back and added her to the box before making my way through the route. But before doing so, I made my way to the berry garden on Route 123 to get all the berries that were there. And along the way, Whiplash became a Tentacruel. Anyway, some of the trainers on Route 119 were a little annoying, but there wasn't that much to them, except the Brains and Brawns duo with Machoke and Kadabra, who did do a little bit of damage. I got through the Weather Institute (Shelly wasn't very tough) and got Castform, which was only notable because it had the Mystic Water. May was next up, and she wasn't anything worth discussion either. I got HM02 for Fly from her, and arrived in Fortree City. So there wasn't much to do here, so we progressed to Route 120, where Steven was and after some talk, he gave me the Devon Scope…after I beat an invisible Kecleon with it. With that in hand, we got the invisible Kecleon that was blocking the Fortree Gym out of the way, and got to Winona. Once again, Winona was a battle that I was away from my computer for, but I’ll try to explain everything I remember. I began with Creme Brule against Swellow, and she used Double Team, but that meant nothing in the face of Toxic being used by a Poison-type. I got the Quick Claw, but that proved to be pointless as she lived my Venoshock with 1 HP, and then used Aerial Ace for a moderate hit before perishing to Toxic. Altaria came next. Again, I don't remember exactly how this went, but I do know that her Earthquake did over half of Crème Brule's remaining health, and I think I used Yawn afterwards. Then she finished me before falling asleep, and I brought in Whiplash and I think used Acid Spray twice before she woke up. She only used Cotton Guard, though, allowing me to finish her from half and -4 with Venoshock. Pelipper came next, oddly enough. I do remember bringing Sour Patch in on it and using Leech Seed, which turned out to not be necessary. I also remember that Larvae beat it, I think with Toxic + Venoshock. Skarmory was last, and I used two extremely weak Psybeams before she finished me with two Aerial Aces (the first did slightly more than Pelipper did). Then I brought in Dope, and I don’t remember what she used (Aerial Ace or Steel Wing), but it did 30 damage and she took Rocky Helmet recoil. Incinerate did good damage. Then she hit me again, which scored a critical hit and left me with 1 HP. Another Incinerate finished her off. Also, sorry if these descriptions of events are vague, it had been a long time since I played this and again some of this I was away from my computer for. Anyway, I got the Feather Badge and the TM for Roost, and was able to progress. We went through Route 120, beating a few edgy trainers, including the one with the Milotic, but that was made much less of a hassle than it could have been thanks to Acid Spray. We were then at Route 121, with Dope becoming a Weezing, and I wanted to make arrival in Lilycove City before getting to Mt. Pyre. And we took on May, who also wasn't a lot worth talking about, even with that Swampert of hers. I picked up some TMs and made my way to Mt. Pyre. There were a few scary opponents, but it wasn't all bad. We got to the top of Mt. Pyre, where I beat Matt's Sharpedo with I think Fastball, and then we had to go back to Slateport City only to discover that they were taking Stern's submarine as well. And battle the 26th strongest member of Team Aqua. That's oddly specific. Going through the Aqua Hideout there wasn't much to it either, I avoided most of the grunts and just made my way to Matt, who once again was bested with the right things, but Archie took off for the sea. So we had to give chase to him! I then made my way into Mossdeep City. Despite my team being Level 36/37, I decided to go through the Gym, get past the trainers, and take on Tate and Liza just to see how badly it would end up. I decided to YOLO it just because, and went in there. I began with Creme Brule and Whiplash, but I meant to lead with Fastball and not the latter. I switched Whiplash out for Dope, and Solrock used Sunny Day while Lunatone OHKO’d Creme Brule with Psychic. 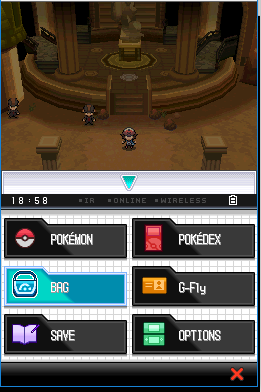 I brought in Larvae, and that survived Rock Slide with 8 HP while Dope was OHKO’d with Lunatone’s Psychic. I brought in Fastball, and used Confuse Ray on Lunatone, as Solrock hit with Rock Slide, finishing Larvae and almost OHKO’ing Fastball, but Lunatone hit itself in confusion. I brought in Sour Patch, and Fastball used Confuse Ray on Solrock, who used Rock Slide, which finished off Fastball and almost OHKO’d Sour Patch. Lunatone hit itself, though, allowing Sour Patch to use Giga Drain to get Solrock into the red. I only had that and Whiplash left, and they healed Solrock before Whiplash used Acid Spray on it for an extremely weak hit, but it halved her Special Defense. Lunatone hit itself again, and Sour Patch used Giga Drain, which finished Solrock thanks to Acid Spray. Whiplash used Acid Spray on Lunatone to half its Special Defense, and Lunatone snapped out of confusion and got Whiplash near 1/3 with Psychic, then Sour Patch finished it from half with Giga Drain, winning me the fight. So I got TM04 for Calm Mind, which I wouldn't be able to make any use of, and then watched a big fat pillar of light emerge on Route 128 before Steven came in and explained what is happening, then gave me the HM for Dive. Before going to the Seafloor Cavern, I decided to go to Sootopolis City first because I can, and do a few optional areas to get some items. Then we took to the Seafloor Cavern…but I decided to leave one of my team members behind so I wouldn't have to waste Strength on anybody. I got through the Seafloor Cavern without too much trouble, avoiding as many grunts as I could, and made my way to the final depths of the place, where Archie had just bested Maxie. Now it was my turn. Even though my entire team was only Level 38 and I was behind one team member, I thought, let's go for it! I began with Larvae against Mightyena. Bug Buzz did well over half as he used Embargo. Alright, fine with me! Another Bug Buzz finished him. Crobat was next, and OHKO'd me with Acrobatics. I went to Crème Brule, and after wondering what to do, I decided to go straight for the Ice Beam. He used Mean Look first, and unfortunately my Ice Beam was looking like a 3HKO. I got the Quick Claw to activate, and Ice Beam froze him solid!!! Very nice. Unfortunately, that only did me good for one turn, as he thawed out and used Acrobatics for thankfully less than half, before another Ice Beam finished him. Then I grew to Level 39. Muk came after, and I decided to go for Yawn. Then his Gunk Shot did less than half my remaining health. I used Earthquake, which did enough for a 3HKO, as he used another Gunk Shot before falling asleep. Two more Earthquakes finished him. Sharpedo was last, and he Mega Evolved and finished me with Crunch. He was faster than Whiplash, who was immediately OHKO'd with Crunch, so I brought in Dope. Crunch almost OHKO'd without a critical hit (left me at 11/101 HP), and got a pointless Defense drop, but I thankfully hit with Thunder and got him right near the red. He finished me with Crunch, but that was fine because I brought in Fastball and finished him with Acrobatics. So Archie was all mad that he was bested, but he was about to awaken Kyogre anyway despite pleas from Shelly. He did, and now everything is super drizzling. After getting called out by Maxie, we surfaced, where they said some stuff and Steven said I should go to Sootopolis. Before doing that, I returned to Lilycove and dropped Dive from Whiplash, and grabbed Protect from the Department Store. Then I returned to Sootopolis and met with Steven, Wallace and the team admins, and received the Aqua Suit from them. And a Big Lipped Alligator Moment with May appearing out of literally nowhere. But I entered the cave! 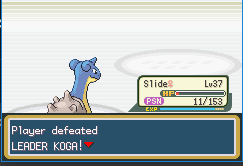 After a bit of traversing, we made our way to the final depths of the cave, where Kyogre awaited. Also, may I ask why my character takes off their Magma/Aqua suit while in this area? Anyway, I taught Toxic and Protect to some of my team members, because I knew that with my levels, this would be a very scary fight that I would need strategy to best. Anyway, then it was time to take on the signature Pokémon of the game, Kyogre! I began with Larvae as it set up its Primordial Sea ability, and it used Body Slam for over half my health…and some Rocky Helmet damage. Heh, I forgot that I even attached that. Then it beat Larvae with an Origin Pulse, but that's fine. It took more Toxic damage. I brought in Dope, and used Protect to block its Origin Pulse and allow it to take more Toxic damage and fall to half. It hit the next turn though, and OHKO'd Dope. But then it fell below 1/3, to the point where one more turn would probably finish it. I brought in Fastball and finished it with an Acrobatics. And Fastball grew to Level 39. So then we have the super long cutscene where everything returns to normal, and now everyone is happy again. Then once all the dialogue was passed, I received the Eon Flute from Steven. Not bad. And next thing we knew, our sights were on the final Gym Leader, Wallace. But we'll take care of that later. Should have the final part up in due time, as I've already played through it. #107 Link to this post, but load the entire thread. April 11th, 2017 (7:45 AM). I haven't got to that point in updating yet. As I've said before, I'm slowly updating this over time, and I haven't hit these yet (afaik). #108 Link to this post, but load the entire thread. April 11th, 2017 (12:08 PM). Edited April 14th, 2017 by PekoTAS. #109 Link to this post, but load the entire thread. April 12th, 2017 (3:30 PM). #110 Link to this post, but load the entire thread. April 12th, 2017 (5:21 PM). Okay, thanks for letting me know. I'll be sure to mark it off next time I update. #111 Link to this post, but load the entire thread. April 14th, 2017 (8:56 AM). After beating Kyogre, I went back to Professor Birch's lab in Littleroot, and got the National Dex. Then I went to Route 114, and found a new Pokémon that can only be obtained with the DexNav: Skorupi. I caught one and named it Cybertech. I did some training with it to catch it up with the rest of my team, and decided that Dope would be the one for me to leave behind. This was the first time I had to actually grind since before Brawly, if memory served. Eventually I got Cybertech to Level 39, and returned to Sootopolis City so I could take on the Gym. Hey, I needed something to take on that Mega Metagross that Steven will have, because otherwise that thing could potentially OHKO everything of mine! 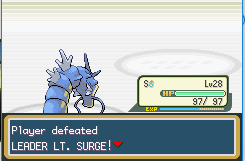 While in the Gym, I did end up beating some of the trainers, but it was alright because we gained some EXP, and Cybertech became a Drapion at that. My entire team was Level 40 when we got to the Gym Leader, so I decided let's just get to it! I began with Fastball against Luvdisc, and Acrobatics was an OHKO. Milotic came afterwards. I decided to use Confuse Ray, but he hit through that and used Ice Beam which did over 3/4 with a critical hit. Acrobatics did around 1/3, and he snapped out of confusion and finished me with another Ice Beam. I went for Crème Brule, avoided a Hydro Pump, and got in an Acid Spray, which barely did anything even with a critical hit, aside from halving his Special Defense. He used Recover and healed right near to full as I got in another Acid Spray. His Hydro Pump did EXACTLY half, no more no less, as another Acid Spray had him at -6 Sp Def and just near half. He hit with Hydro Pump next turn and finished me. I brought in Larvae, took a Hydro Pump for a little over half, and got in a Quiver Dance. Then I used Moonlight to heal up before he used his last Hydro Pump to get me near half. I used another Quiver Dance before he used Recover. I then healed right near full with Moonlight and took an Ice Beam for not much at all. Bug Buzz then got him to 5%... Even with -6 on him and +2 on me that wasn't a kill. Unbelievable. Ice Beam had me a bit below 2/3. He healed, and Psybeam got him near half. Bug Buzz then finished him. Whiscash was after, and Bug Buzz did less than half. Zen Headbutt left me at 6 HP, but that was more than half my total health, so I just went for another Bug Buzz and got him near 1/5 before he finished me with another Zen Headbutt. I brought in Sour Patch and finished him with Petal Blizzard. Sealeo was next up. I went for Giga Drain, which got him into the red, and his Aurora Beam did less than half but lowered my Attack. Another Giga Drain finished him and healed me to 2/3. Seaking was last up. Giga Drain got him near 30% or so, as he used Rain Dance. He used Horn Drill, and thankfully missed, allowing me to finish him with Giga Drain for the win. And Sour Patch grew to Level 41. So I got the Rain Badge and HM05 for Waterfall, which I unfortunately had to teach to Whiplash. I made my way to Ever Grande City, and once that was done with removed Waterfall from Whiplash, but not without going to a few optional areas to get a couple items, including TM62 for Acrobatics, which Fastball does already have but it's nice to have it so I can erase and reteach it whenever. Then it was time for Victory Road! To start, there was a Sigilyph that could've done big damage, but I had Whiplash cut its Special Defense with Acid Spray then slam it with an Ice Beam. Next was a Froslass that trolled me big time with Confuse Ray, as it was somehow faster than Fastball and beat it without me getting to do anything to it, and it very nearly did the same to Crème Brule, but after hitting myself seven times in a row in total, I managed to live with 3 HP and finally use Yawn against it, allowing Cybertech to 2HKO it with Night Slash. Later we had the Ace Duo with the fossils, who did do a fair amount of damage, including the Armaldo OHKO'ing Sour Patch with X-Scissor without a critical hit even with the Eviolite, but we got through them. We also had Ace Trainer Vito, who started by blowing up on Cybertech for more than 1/3, using a Darmanitan that ran through two of my team members with Flare Blitz, used Taunt on Crème Brule and wasn't quite finished off with Earthquake only to die to his own recoil afterwards, and his own Swalot which I managed to beat with Larvae. Why, I don't know. Then we had a Dragon Tamer who I accidentally ran into before I could heal up, so only half my team was alive right then. He only had one Pokémon, a Kingdra, which Larvae managed to beat thanks to Quiver Dance, Sludge Bomb poisoning, and Moonlight. The last opponent consisted of that Brains and Brawns duo. Fastball OHKO'd the Primeape with a critical hit Acrobatics that may or may not have mattered (I was a hair from Level 42), but Cybertech 3HKO'd the Musharna with Night Slash. But next up was Wally… And ho boy was I scared for this fight. Or that Mega Gallade, at least. But anyway, he began with Altaria, so I started off with Whiplash. Ice Beam didn't quite OHKO, but he hit with a pretty weak Dragon Pulse. That allowed me to finish him with another Ice Beam. Magneton came after. Knowing that this thing is weird, I used Ice Beam to break its Sturdy on the off-chance I'd freeze it. I didn't, but I did around 1/7 and he used Tri Attack for not much. Surf then scored a critical hit that probably mattered, and finished him. Then we had Roselia. I brought in my mirror-match, so his Leech Seed failed. I was faster and got in a Grass Whistle, allowing me to bring in Crème Brule as he continued to snooze. He woke up and used Petal Blizzard for a laughably weak hit, while Ice Beam did barely over half and froze him. He remained frozen, allowing me to slam him with another hit. Delcatty was next up. I stayed in, took another pitifully weak Feint Attack, and used Yawn to make him drowsy before switching Larvae into another weak hit, and having him take Rocky Helmet damage before falling asleep. I got in four Quiver Dances before he woke up and used Disarming Voice for no adequately explained reason, then avoided a Sing on the fifth (…) and then he used Disarming Voice again on the sixth. Sludge Bomb finished him. Gallade was last. Ho boy! He Mega Evolved, and even with +6 Sp Atk all that build up was for…barely over half before he slammed me with Psycho Cut. I brought in Whiplash, and he used Slash for whatever reason, which I lived with 4 HP. That allowed me to use Brine and finish him off. Larvae had Quiver Dance, Roost and Bug Buzz, and his last move was interchangeable. Whiplash had a handful of TM moves that were interchangeable, so I gave him Barrier and Acid Spray to begin. He had Toxic and Venoshock but those would obviously be changed. Fastball wasn't much different. I dropped Fly from him for Screech just because. Crème Brule had Yawn, Encore, Stockpile and Acid Spray. She was mostly able to do whatever I wanted her to, but I knew I wouldn't be sticking with all four of these moves in the end. Sour Patch was mostly there. I had Giga Drain, Synthesis, Grass Whistle and Leech Seed. The middle two moves were there just because, in case I decided to drop one of them for something else. And finally, Cybertech I didn't give a Poison-type attack to because his best is Poison Fang, since Poison Jab is stupid hard to get in this game. Why? He had Acupressure, Crunch, Ice Fang and Earthquake. Anyway, it was Elite Four time! First up was Sidney. 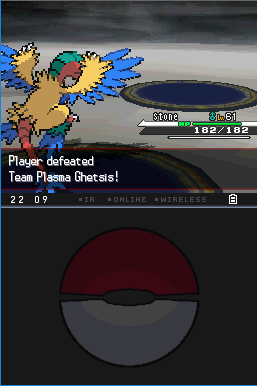 I began with Whiplash against Mightyena, and Clear Body blocked his Intimidate. I started with an Acid Spray that actually did okay for a 40 BP STAB move - roughly 30%, but he used Swagger. Obviously not about to have any of that, I switched in Larvae, and his Sucker Punch failed. Bug Buzz finished him. Shiftry was next…uh, okay? This is perfect? He used Fake Out for a weak hit, but because of Shield Dust, no flinch for you. Bug Buzz slammed him. Absol was afterwards. Now this could be scary. He was faster and used Psycho Cut, which got me into the red, but Bug Buzz OHKO'd with a critical hit. Not bad! Sharpedo followed that, and I brought in Fastball, as his Aqua Jet did a little less than 1/3. Acrobatics OHKO'd, but not without Rough Skin damage. And Larvae grew to Level 51. Cacturne came after, and used Spiky Shield to block my Acrobatics and deal damage. Next turn he was OHKO'd though. Phoebe was next up. This could be intimidating, given that most of my STAB attacks will be useless against her, but hopefully not. I adjusted and then entered. Alright, time for what could potentially be scary. I began with Sour Patch against Dusclops. I went straight for the Giga Drain, which did over half…before she used Curse and finished herself off. But I did take Curse damage, which I wasn't wild about. Her first Banette was next, so I brought in Cybertech, causing her Psychic to fail. Crunch was an OHKO. Sableye came after, and her Fake Out missed because of my Lax Incense, while Crunch did over half and got a not necessary Defense drop. I then finished her off. Dusknoir was after. Oh boy! I brought in Crème Brule as she used Fire Punch. Even with a critical hit it did barely over 1/4, and she took Rocky Helmet damage. I used Shadow Ball, which got her to half, but that's not too bad. Hex got me right near half. I used Shadow Ball again and got her into the red. She used Hex once more, doing more than 1/3 my remaining health. She healed, and banking on that I used Yawn, making her drowsy. I used Shadow Ball for slightly less than 1/3, but I did get the Special Defense drop, so that was welcomed. She used Hex, which scored a critical hit and left me with 9 HP before she fell asleep. I got her low with Shadow Ball, and she healed again, unfortunately. But even at that, Shadow Ball was still able to 2HKO her thanks to the Special Defense drop. Her second Banette was last, and I switched Fastball into a weak Feint Attack. Acrobatics didn't OHKO, and she used Will-o-Wisp, but it's all good, because I finished her with another Acrobatics. After healing up and adjusting my team, knowing that my Poison-type attacks would be effective again, I entered the next room, where we were met with Glacia. Alright, let's do this! Also, it's been said, but that evil smile of hers is ****ing creepy. I began with Crème Brule against her first Glalie. She used Crunch for a critical hit that did 1/4 my health. Seriously? At least she took Rocky Helmet damage, but Sludge Bomb got her just near half. Then she used Hail, and Sludge Bomb got her into healing range as I took damage. She healed, and I used Encore, forcing her to be locked into Hail. That allowed my Sludge Bomb to be a 3HKO, and while I got no poison on any of them that's actually not as bad because she wouldn't have healed again. Then the hail stopped. Perfect timing, because one of her Froslass came out! She used Confuse Ray, unfortunately. So of course I hit myself, and she used Hail again. But I did snap out of confusion and get in a much needed Yawn. She used Blizzard, which got me to 6 HP before I got in a weak Sludge Bomb…and still no poisoning. Then the hail finished me off before she fell asleep. I brought in Larvae, and as she snoozed, I used Quiver Dance before taking hail damage. I used another as she continued to snooze. Feeling daring, I went for the Shadow Ball and got her into the red. But she continued to snooze, and the hail stopped. That's definitely a good thing, as she healed, allowing me to get in a third Quiver Dance. Shadow Ball…didn't finish her off!!! She used Hail again as I took damage. I hit through Snow Cloak and finished her with another hit, though. Her second Froslass was next, and this one too barely lived, but with more than the previous one did. Then her Blizzard got me around 2/3 before hail damage got me a little above half. I used Roost before she used another weak Blizzard and I took more hail damage. Bug Buzz finished her off before the hail stopped. Walrein came next in line. I used Bug Buzz…which OHKO'd with a critical hit. Not bad! Her second Glalie was last, and Bug Buzz didn't OHKO it, and she used Hail. Shadow Ball finished her off, but not without her using Protect like a loser. And getting me to half with Ice Shard. And Larvae growing to Level 52. Well that was interesting. Next up we had a Dragon-type master to prepare for. I wanted this to be Crème Brule's fight. I dropped Encore from her for Ice Beam as well as Sludge Bomb for Rest. I felt like Encore wouldn't be necessary anymore, though there's a part of me that feels like I'd end up eating those words against Steven. In case she didn't work out here, I also threw Ice Beam onto Whiplash, too. Anyway, time to take on Drake! And tell him to quit releasing so many mixtapes all the time. I began with Crème Brule against Altaria, as he began with Cotton Guard. But I counteracted with Yawn. His Dragon Pulse did pretty weak, doing not even 1/4 my total health. Ice Beam got him out of healing range before he fell asleep. As he snoozed, I got in a Stockpile. Same thing next turn. He woke up and used another weak Dragon Pulse before I slammed him with another Ice Beam. And Crème Brule grew to Level 51. Flygon came after. It was the one with Earthquake, and it unfortunately did over half my remaining health. Ice Beam failed to kill him, and he healed. Then… I froze him solid!!! But that would've been nice next turn, as he healed again. And I didn't get a critical hit on the next turn, so I was forced to switch out for Fastball, which caused his Earthquake to fail. Acrobatics finished the job and got Fastball to Level 51. Kingdra was next up. I began with a Screech to half his Defense, as he used Yawn. Acrobatics…left him with 1 HP. Ice Beam did more than half, and I snoozed, so he finished me next turn. I brought in Sour Patch and finished him with a Giga Drain. His second Flygon was next. I was faster, and Giga Drain did just over half as he used Screech for whatever reason. Another Giga Drain finished him off. Salamence was last, and as he got off a pointless Intimidate, he missed with Zen Headbutt (!!!) and I hit with Grass Whistle. Alright, not bad at all. As he snoozed, I hit with Leech Seed, so his health was sapped. I switched in Cybertech, and he woke up, but his Zen Headbutt failed and he took more Leech Seed. Then he used Dragon Rush for over half…and I flinched. I did gain with Leech Seed though… But that wasn't enough to save me. I brought in Crème Brule again, hoping maybe he would miss with Zen Headbutt again… And he did!!! That allowed me to finish him with Ice Beam. Whew! With that taken care of, we had but one obstacle remaining: the Champion. Unsurprisingly, I was terrified for this fight. How the heck are we going to beat a team of Steel-types with some Psychic-types - including that Mega Metagross - with a team full of Poison-types?! Well, we're gonna have to try! I adjusted my team, and entered the Champion's room, where it was none other than one Steven Stone. Alright, here we go! I'm nerve-wracked for this fight, but we have to go for it! Let's do this!!!!!!! This was my second attempt. First try we were actually doing pretty well, as I still had four Pokémon left, but then his Cradily got in two Ancient Power boosts in a row. That left me unable to do my strategy and essentially sealed my fate, so I decided to start over. 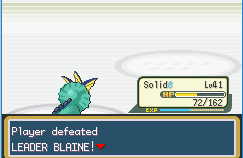 I began with Whiplash against Skarmory. I used Scald and got him barely over half, as he used Spikes. Surf then finished him… Or not. And he used another layer of Spikes. He healed, and Surf didn't even get him into the yellow. Another Surf barely failed to finish him off as he got in a third layer of Spikes. I then finished him with Scald. Aggron came next up. I accidentally mis-clicked and used Protect, not that that really meant anything beyond blocking his Earthquake. Then I used Scald, which got him to Sturdy. I lived his Earthquake with 4 HP and finished him with an Ice Beam. And it scored a critical hit for lulz. Claydol was next up. I used Scald…which scored ANOTHER critical hit and burned him! Wow! Talk about a jackpot right there! He finished me with Earth Power, but then he was finished off with burn damage. I brought in Sour Patch as he used Cradily, much to my dismay. I managed to hit with Grass Whistle, and he snoozed. I brought in Fastball, and he unfortunately woke up first turn and used Confuse Ray. I switched in Crème Brule, took Spikes damage, and then an Ancient Power for just barely under 1/3 my remaining health. Remembering that I dropped Encore, I used Yawn before he got in a Confuse Ray. I hit through confusion and used Rest, as he used Ancient Power for slightly less than the Spikes damage before he fell asleep. We both snoozed for the next two turns, then I woke up and was still confused, but got in a Stockpile as he continued to snooze. I hit through confusion once more like a champ and got in a second Stockpile before he woke up and used Ancient Power again for a pretty weak hit. I snapped out of confusion and used Yawn before he used Ancient Power for not much. Alright, still no boost, this looks promising. I then used Earthquake just to stall for time, which didn't do much at all as he used Confuse Ray again. I switched in Fastball as he snoozed, then I got in a Screech to half his Defense. But I missed with the second as he woke up and used his last Ancient Power, which got me to 1/4 with a critical hit but thankfully didn't get the boost. I got in a second Screech before he used Confuse Ray, and I managed to hit through confusion to do the same to him. He hit himself for a noticeable amount, as I finally brought in Cybertech and took some Spikes damage. I wasn't wild about that, but he hit himself in confusion again and was near 1/3. I then used Acupressure and got an accuracy boost as he snapped out of confusion and used Confuse Ray, unfortunately. I hit myself for not much at all, as his Giga Drain did 1/6 my health. I hit myself again as he used Sludge Bomb. I snapped out of confusion and got a Defense boost from Acupressure, which is definitely good news. I survived his Giga Drain with 4 HP, allowing me to use Rest. He used Giga Drain for not much, and then he used Confuse Ray followed by Sludge Bomb. I woke up and managed to use an Acupressure for an Attack boost followed by Giga Drain getting me to half. Then I got an evasion boost and I was at 1/3. I then snapped out of confusion and got another evasion boost, and even with all of that he still hit with Sludge Bomb and got me near 1/6. I used Rest again, avoided three Confuse Rays, and then woke up and got another Defense boost before avoiding his last Confuse Ray. He used Giga Drain for an insanely weak hit, then I got a Special Defense boost I think before avoiding a Sludge Bomb. Then I got another Defense boost - which had it maxed out - and avoided a Giga Drain. I got another Attack boost and avoided another Giga Drain. Then I got a pointless Special Attack boost and he hit with Sludge Bomb, but for an insanely weak hit. Then I got a Speed boost before he used Giga Drain again and hit. Now, every single one of my stats had at least +2 going for them. I used Rest for good measures, avoiding two Sludge Bombs and getting hit with Giga Drain before waking up, getting another pointless Special Attack boost, and avoiding a Giga Drain. Then I got another Special Defense boost, so his Giga Drain only did 8 damage. I decided it was time to finally put him out of his misery and used Crunch, finishing him. Four of my team members gained experience from that, haha. Armaldo was next. I used Crunch, which even with +4 didn't OHKO him, but it got the Defense drop before he used X-Scissor for another weak hit. He healed, but I OHKO'd him and Cybertech grew to Level 51. Metagross was last. He used the Mega Stickpin and Mega Evolved, and I avoided a Bullet Punch before OHKO'ing him with Crunch, ending the battle and completing the challenge! So yeah, sorry for the excess usage of Acupressure, but I really didn't have much else of an answer to this one! Anyway, as Steven was about to crown me as the Champion, May and Professor Birch showed up but realized I had already claimed the title. Steven then inducted me as Champion, and I then watched the credits. Here's who got showcased at every memorable occasion! After all of that, it was time for one final battle with May. I began with Whiplash against Swellow, and Ice Beam was an OHKO. 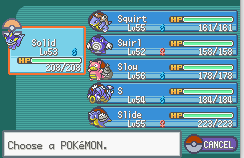 Raichu was next, and I used Surf for more than half as she used Thunder Wave. She used Thunderbolt for half on the dot, as I finished her with another Surf. Magcargo was next, and I OHKO'd that with Surf as well. Breloom came after, and she left me with 4 HP with Seed Bomb, only for me to get fully paralyzed and have her finish me next turn. I brought in Fastball and slammed her with Acrobatics. Swampert was last, and she Mega Evolved into Mega Swampert, while Acrobatics did less than half and Rock Slide was a 2HKO. I brought in Larvae, wanting to end this with our first proper catch, and finished her with Bug Buzz. #112 Link to this post, but load the entire thread. April 14th, 2017 (9:17 AM). #113 Link to this post, but load the entire thread. April 15th, 2017 (6:30 AM). idk what my last update for the my monoflying challenge again but here. - defeated the game lol. That brings my challenge completion to 2/18 types (Grass/Flying) although I am yet to do Gen VII for both. Oh well. #114 Link to this post, but load the entire thread. April 15th, 2017 (2:02 PM). Edited April 15th, 2017 by treekoman9. #115 Link to this post, but load the entire thread. April 15th, 2017 (4:24 PM). Edited April 16th, 2017 by jombii. Grinded both, evolving Poliwhirl to Poliwrath and Slowpoke to Slowbro. Started Silph Co. Reclamation Mission. 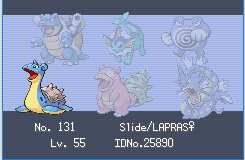 Defeated Rival again and acquired Lapras. 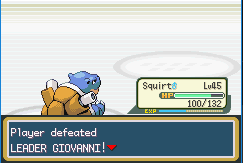 Defeated Giovanni and got Master Ball. #116 Link to this post, but load the entire thread. April 16th, 2017 (9:28 AM). #117 Link to this post, but load the entire thread. April 17th, 2017 (3:28 PM). Edited May 7th, 2017 by Skarper. Hi guys, just a little update: did the first island, and now I'm going to train my Oricorio ( a friend traded some purple nectar). #118 Link to this post, but load the entire thread. April 20th, 2017 (2:29 PM). #119 Link to this post, but load the entire thread. April 22nd, 2017 (7:40 PM). Edited April 22nd, 2017 by jombii. Got defeated in E4 multiple times, but hey, experience. 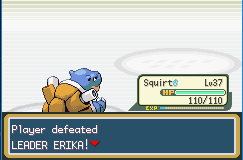 Finally defeated E4. Lorelei was the hardest of them, Lance the easiest lol. Finished monotype water for LG! #120 Link to this post, but load the entire thread. April 25th, 2017 (11:51 AM). Edited April 25th, 2017 by Ronintoad. I really should come up with some nicknames for these guys but I've always been fond of using their actual names like they do in the anime. - Why do so many Pokémon have Astonish in this game? I was really proud of how I defeated Roxanne with just Nincada. #121 Link to this post, but load the entire thread. April 27th, 2017 (12:41 PM). Edited May 7th, 2017 by Skarper. Completed two more trials but need more train for Mallow's trial. #122 Link to this post, but load the entire thread. April 28th, 2017 (4:43 PM). Edited May 5th, 2017 by jombii. Captured Wooper and started grinding. Captured Chinchou. Started grinding both Marill and Chinchou. Had difficulty in battling Chuck because my Slowpoke is still weak af. Defeated him though after a few tries. Defeated Jasmine. Mud Bomb Quagsire ftw. Defeated Pryce. Iron Tail Azumarill ftw. Currently trying to liberate Radio Tower. #123 Link to this post, but load the entire thread. April 29th, 2017 (8:38 PM). Went to the Yellow Nectar Meadow and caught a Petillil to add to my team temporarily. Defeated Hala with Work Up Peck from Rowlet. #124 Link to this post, but load the entire thread. May 7th, 2017 (11:43 AM). - Holy crap, why does every Normal type Pokémon either know Faint Attack or some other move to take care of Shedinja? 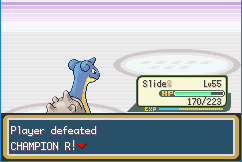 - Defeated May once again! #125 Link to this post, but load the entire thread. May 7th, 2017 (4:45 PM). Finished Mallow's trial but it wasn't easy, a lot of setups necessary to attack properly. Also did the Dimensional Research Lab part and am now in route to Digglet's Cave!